Adelaide is Australia’s fifth largest city and has an economy that has moved away from the manufacturing sector of years gone by to a more balanced and forward thinking economy. While manufacturing work is still available there are many employment opportunities in fields such as research, defense technology, the service industries and commodity exports. There are also great choices available in the healthcare industry, wine, foods industry and with half of all the cars manufactured in Australia coming from Adelaide the automotive industry is also strong. In 1992 Adelaide’s local government collapsed with debts of over $4 Billion dollars – it goes to show how well and how quickly the economy has recovered with it since recovering it’s AAA+ rating, so, thanks to that, there are many high hopes for the Adelaide economy over the coming years. The city of Adelaide itself has recovered from its deep colonial roots and *stigma* of being a remote outpost to one of progression, style and energy. It has a large commercial center and a sense of space with an uncluttered urban feel. 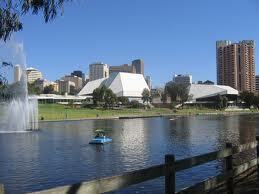 Adelaide has the feel of a large country town, while retaining its history, parklands, old buildings and wide streets. It is now a mainland capital city with a significant economy that weathered the recent global economic crisis quite well, with billions of dollars worth of upcoming projects *in the pipeline* with much of the work coming from the defense and mining industries. Those looking to find work in Adelaide should approach companies related to defense, mining, retail, healthcare and community services – industries all areas that employ the largest workforce in the city.While wages in South Australia are generally less than other states that is balanced by an overall lower cost of living, including house affordability. There is very little traffic and the transport system is easily accessed, this once old city with a struggling economy is now a bustling city with excellent nightlife and entertainment. In general Adelaide is a great place to work and is a great place for those with families, or, who just want a good balance between career and lifestyle. The pace of life is far more laid back and less *aggressive* compared to some of the other capital cities. With jobs in the car manufacturing sector, medical research, engineering and mining, jobs are ripe for the taking, with some mining operations planned that could see the creation of over 10,000 new jobs. If you are looking for something different, or a career change, the mining industry often has work available, for both those with or without specific skills. Training can be provided, and mining is no longer just about mining, with jobs available in areas such as catering and domestic staff, shift supervisors, dump truck operators, drillers, laborers and machine operators. Getting in on the *ground floor* and getting some training will help set you up for the expected boom in mining industry jobs. Do you work in Adelaide, what do you find attractive about working there? Have you considered moving interstate for work? What would entice you? What would turn you off? We’d love to hear all your stories. Has our series of articles made you look into the possibility of moving interstate for a career change?